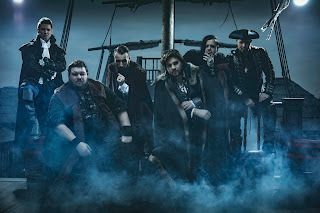 Paddy And The Rats Releases New Video for "Castaway"
Paddy And The Rats have released a new video of the song titled "Castaway". The clip was shot last October at a stormy shore at the Algarve in Portugal, of course, and gives a good taste of what the upcoming album is going to be like, as it is being released on April 6th 2018. Singer/bandleader Paddy says about the clip: "The Algarve is one of the most stunning and most natural coastline of Europe so it was perfect to shoot the video. We wanted to feel like I'm truly on a desert island and there's nowhere to go and no one to talk. While we were shooting I had to be in the cold ocean for hours long, walk without shoes all day long in the underbrush. And I realized, if I had to do this for years because I'm a castaway, that's really not a nice thing even if there's an amazing beach. Nature is so much stronger than you. The lyric is an allegory. Sometimes you feel yourself so isolated in life if you were a castaway. But you always have to go on, like in the myth of Sisyphus. You know at some point your stone will fall back but you have roll it on again and again. You can never give up." Check out the video for "Castaway" HERE.